It may be difficult, sometimes, to find a gaming group. Or maybe everyone has commitments that stop them from meeting on a regular basis. There are times when you just want to game, but you’ve only got yourself for company and the last thing you want to do is sit in front of a computer screen tapping keys. Say hello to Dungeon: A Solo Adventure Game. Dungeon is a self contained game that enables a player to have random roleplaying adventures without the need for those pesky Gamemasters sitting at the head of the table hogging all the limelight. It has the feel of an old-school gamebook - such as the Fighting Fantasy series - but there’s no page-flipping. Every game is a random sequence of events that your hero has to fight through to win their goal and gain the treasure. All you need are some six-sided dice. The book itself is a 47 page PDF with a colour cover and black-and-white interior. The cover is quite striking, with a red leather-like background and the image of what could be a fossilised dragon splashed across it. It’s quite effective. The interior is black-and-white with large print and small pieces of simple but effective artwork. There are nice scroll-like borders on the hero, quest and encounters pages that are quite pretty and add to the atmosphere. It would have been nice to see more artwork invoking the genre, such as warriors and monsters, and more illustrations in the bestiary would have been a good addition - I always like to see what I’m fighting. It’s all very well laid out, easy on the eye and professionally done. You also get a sheet of Dungeons Cards you can print out with monster and encounter details on – more on this later. Players get to choose from four Heroes – the barbarian, the dwarf, the elf and the mage. Each of these heroes has abilities and equipment that will help them in different ways during the adventure so what you choose will make a difference. Each hero (or monster, for that matter) has a set of simple stats – Combat Dice, which denotes how many D6 the player rolls when attacking. Armour, which indicates the target number you have to reach on the Combat Dice roll to injure your opponent; for every die that scores equal to or above this number you score a single wound. Wounds are the health score of the hero. Magic Dice, if you’re playing a mage. Speed, a form of initiative score, and Gear, what the hero is carrying. Magic is handled in a similar fashion as combat, with scores for the difficulty in casting the spell acting in a similar fashion to the Armour score. As you can see, the system is very simple and I’ve managed to give you an idea of how it works in the stat description above. Anything more would give away the entire system, so I won’t go into any more detail here. The combat system is incredibly simple – you roll and damage, they roll and damage, until one of you drops down dead. It’s a nice and effective little system and plays out really well. Now that you’ve got a hero, you need an adventure for him or her to go on. Quests are a sequence of twelve random encounters, called in the game ‘Areas’, that the hero has to overcome in order to reach the ‘Final Area’, the conclusion to the Quest. In overcoming these Areas and the Final Area, the hero can increase in treasure, items and abilities. What is in each Area is decided upon randomly and can take the form of a Monster to fight, an Event to overcome or a Quest Monster to defeat. Each Quest also has a different Final Area with special goals for the Hero to reach in order to complete the Quest. First of all, you choose one of six quests – these are the simple goals to achieve that have a possible Special Rule, which tells you how you begin or what may happen during the Quest; a Final Area which gives you the goals to overcome after surviving twelve Area; and the Quest Monster, the primary foe of the Quest. Each Area is rolled for randomly, or you can use the cards I mentioned earlier – first, a 1D6 decides whether you encounter a foe, an event or if nothing at all happens. Upon rolling for an Encounter or an Event, the player then rolls 2D6 on the relevant Encounter or Events tables. Encounters decide what monster you will fight, including the Quest Monster, and Events tell you what other things befall your hero, such as cave-ins or finding a fountain. These Events can also have their own sub-tables to randomise effects should you decide to interact with them. From all of these areas the hero has the chance to earn gold, potions and artefacts to help them on their Quest. All of these tables create a random variety of results that keep the game entertaining. Upon completing the Quest, the hero can earn Experience, which increase their Wound stat, learn a skill that ups their abilities, or earn even more gold and artefacts. This is decided on randomly. For two dollars what you have here is a quick, easy and simple game that will keep you entertained for quite a while. You also have the basics of a great introductory roleplaying game with simple mechanics and a form of character advancement. It certainly looks the part – the simple colour cover is quite evocative and effective, and the interior is well laid out and easy to read. It does suffer slightly for lack of illustrations and it would have benefited from more images. I’m also a sucker for game world maps, too, so it would be nice to see where it is I‘m adventuring, but that’s a personal preference and bears no impact ion the game itself. You could quite easily set this on your favourite game world. The game itself takes about ten minutes to fully learn and I’ve played out quests that last ten to twenty minutes, so it makes it perfect for a pick-up-and-play game if you have nothing else on or if you’re on along journey. It is fun and the random nature of the game keeps you on your toes and makes every game different. With only six quests in the book and two lots of Areas that equal 22 events it is easy to see that games will become repetitive, and in fact I have had a couple of games that have felt very similar. It does say in the book that future expansions will provide additional Quests, which is a good thing, and it would be nice to see an increased number of Encounters and Events to supplement what is already in the book. This would definitely add some longevity to the game, but they’re so easy to do then there’s nothing stopping enterprising players from creating their own. You could create them for your friends and challenge each other. You can use the random dice for the Areas or print the cards that come with it. 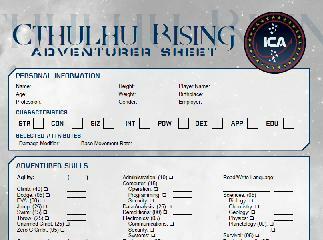 To be honest it’s much easier to print the whole thing out as it makes it easier to refer to the sheets you need. I can recommend this game. It’s a great little system that you can use for its intended purpose or as an actual roleplaying game for your gaming group. If you’re looking for a rules-light system then there’s a great one right here. I would have liked to have seen more artwork, and the longevity of the initial game itself may suffer due to the repetitive nature of the rolls, but for two dollars you’re getting a great game that’ll keep you entertained for hours. The public playtest document of the Kings of War RPG will now be publicly available via the Mantic Games fanzine 'Ironwatch' in issue 5, out on January 1st. It includes playtest details, additional rules for skills, single combat and experience, and a full mini adventure 'The Ghost King's Barrow'. The idea is to playtest the rules in the public domain, generate feedback to myself so that I can make informed decisions about additions, removals and changes, and then produce a full roleplaying supplement for the already fantastic Kings of War main rules. 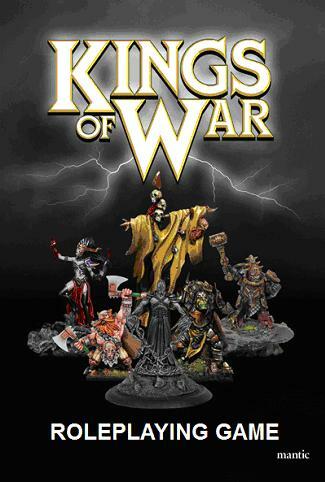 The Kings of War rules can be downloaded for free from their website; the roleplaying game itself is based more on the full hardback book release, but the RPG can be used quite comfortably with the free download. Contact details for feedback and comments are in the playtest document. It's hard to believe that it's been nearly thirty years since I picked up my first ever Fighting Fantasy gamebook, No. 2 'The Citadel of Chaos', and played it to death over a whole weekend. It wasn't just my introduction to gamebooks but to the gaming hobby as a whole and from there I delved into Dungeons & Dragons and never looked back. I've still got the book, the edition is the one you see here on the left. Mine is in much worse condition - bent covers, yellowed pages, dirty thumb marks, faded spine. I got a lot of use out of that book before I bought another one, and before I knew it I'd started collecting them. Titan was a great world to game in and I introduced a lot of people to the RPG hobby using the Fighting Fantasy rules and the Port Blacksand setting. The mind boggles - that's more than a quarter of a century ago since I bought it. It's great to see the gamebooks continuing with their official website and the fan-made material such as Fighting Fantazine. A lot of people still get a lot of fun out of it and for me it has a very special place in my heart. Even after all these years I'd still like to run a one-off Fighting Fantasy roleplaying session, using the rules as written in the book 'Fighting Fantasy - The Introductory Roleplaying Game'. You know, the one with the man-tiger exploding out of the die on the cover. 30 years of Fighting Fantasy. Wow. That means that next year I'll have been in the hobby for 30 years, too. That simply doesn't bear thinking about. I'm looking at running my own science fiction games on Monday night. Big J is running his fantastic Basic D&D games on Thursdays at his place, but as much as I love fantasy I have a science fiction itch I need to scratch. 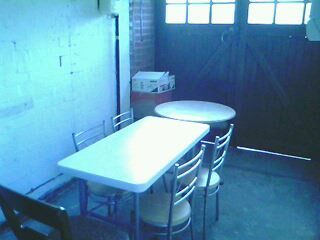 To this end I've decided to utilise my sparse garage as a gaming room. There's some stuff in there but after clearing the majority of it out there was enough room for a small dinner table and a four-seater fold-out table. This means I have enough room for GM stuff and five players, which is a gaming group number I'm very happy with. The floor is still a bit crappy and the walls are bland, but even in the UK winter it's still warm as the boiler is in the garage and it's well insulated, with no damp or water leaking in, even after the horrendous weather we've had recently. Facilities are right inside the kitchen door so the rest of the house will not be disturbed by the weirdos in the garage, and there's power points galore and wi-fi for anyone wanting to bring their laptops. All in all, it looks pretty good. First of all I'm, having a stab at some sci-fi Cthulhu but I'm hoping to get D6 Star Wars back on the go. It's a good little gaming space, and I'm looking forward to seeing how we get on in there. ... so I think I'm gonna have me some fun. The 1 Hit Point D&D Thief Lives! After a rumble with some wolves and an attack on a bandit group, our resident sneeze-and-he-dies character is still breathing. It's added an entire new dimension to the game now that we have the added difficulty of watching out for the thief - his skills are turning out to be pretty valuable so it would be a shame to lose him. To this end we've hired a retainer to look after him. So, even though it is a bit of a pain that one of our party is on minimum hit points, it adds a whole new dynamic level to the group. We're not babysitting him, that's for sure, but we just want to get him past first level and pray that he doesn't roll another '1' on the next level. All that affects how we approach encounters as the safety of the thief is foremost on our minds. After the last game Andy, the thief's player, was talking about just piling in and sharing the danger. I don't think so, mister! Well, blow me, I've found a list in my very old gaming bag that details D&D characters, and others from other games besides, I used to play and what happened to them. How incredibly strange, mainly because two of the names on there I don't really recognise. They ring a bell but I can remember playing them. Jamm Donut, 1984, D&D Thief, second level, retired. Scoom, 1985, D&D Fighter, first level, killed by giant spider. Garee Smiv, 1985, D&D Fighter, first level, killed by coffin trap. Horatio something or other, can't read it, looks like 'Graves', 1985, D&D Elf, second level, retired. Mask Horatio (yeah, that was original), 1986, D&D Fighter, second level, killed by goblins. King Krong (what?!? ),1986, D&D Cleric, fourth level, killed by the DM (I wonder what that means? I can't remember). Smog, 1986, D&D Elf, third level, killed by Dragon (that's a pretty good way to go). Scaroon Degrall, 1987, D&D Fighter, second level, killed by giant spider (what are the odds!?!). Master Skarill, 1989, AD&D Fighter, second level, retired (but only because I dropped out of the game because it was pretty bad). Goah Galletti, 1987, Star Wars D6 smuggler, lasted until 1994 when he blew himself up flying a transport into an Imperial warship to save the party. Tere Swordsong, 1988, MERP Scout, level 8, retired (Possibly my favourite character ever). Matthew Haskenn, 1989, MechWarrior House Davion Special Forces, retired (Is now fighting pirates in the outer reaches of the sphere). Zeke Greyfellow, 1990, Shadowrun Street Samurai, killed by a Dragon (What, again?!? I appear to have no luck with giant spiders or Dragons). Kaile Mirrener, 1993, Star Wars D6 mercenary, lasted two months and got shot in a corridor (There's an angry face drawn after that, obviously I was pretty miffed about that for some reason). Mornard Winter, 1996, Warhammer Fantasy Roleplay Half-Dark Elf soldier, killed charging enemy units outside Altdorf (He was a good character, it was a shame to lose him). Mornard was my last proper character as I spent all my time GMing, but since 2009 I've had a D&D 4th Edition Tiefling Cleric, two Pathfinder Human Rangers, and right now I'm playing a Basic D&D Dwarf called Burgen. I remember some of the escapades of some of the characters. I remember Jamm Donut's first kill, and my first ever victory in an RPG - a skeleton. I remember Smog throwing himself at the dragon, one part bravery and one part the fact that I was bored with the character. Goah Galletti being an obnoxious moron and I played him for the better part of seven years. Tere Swordsong leadingan army to battle, and retiring as an innkeepeer with an Elven wife and two children. Matthew Haskenn throwing a grenade into an ammo dump by mistake. Zeke Greyfellow being chased on his Yamaha Rapier through a park. Mornard Winter tackling a vampire out of a tower window into the sunlight. But I've forgotten more than I remember. And looking at the names I can't even recall creating, that seems like a damn shame. In our ongoing Basic Dungeons and Dragons game we've lost a cleric and a magic-user in two games, one through violence and the other through accident. Now, we've not replaced the cleric yet (I think the player was more of a Pathfinder fan where your chances of survival are somewhat increased, so we've not seen him again). but the magic-user dude has rolled up a new character and, as agreed, we're sticking with the rolls we get. His new thief is pretty good, with some high rolls for his stats. Unfortunately, he rolled a one on his hit point dice. That's right. A one. There were some comments regarding letting him re-roll and the like, but he stuck by the rules and the agreement we had all made before creating the characters and starting the game; he didn't change any of his ability score rolls and stuck with his single hit point. To balance this out, he got himself a bow so that he wouldn't have to get involved in heavy combat, and we've hired a retainer to look after him and our gear, which is costing us a pretty gold piece. Games it will be made publicly available via the Mantic Games fanzine 'Ironwatch' issue 4 out December 1st. So make a note in your diary - December 1st 2012 in the Ironwatch fanzine. I've gotten into Kings of War recently. 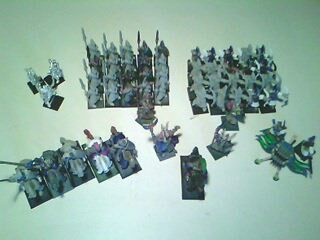 So much so that I've developed a roleplaying game system around the wargaming rules and I've put together my own 800 point Elven army. I got the miniatures for next to nothing a few months ago - they're very old Games Workshop figures from about a decade and more ago and they've already been painted of a sorts, but the design and size is perfect for a Kings of War game and I'm just missing a couple of scout miniatures, but other than that I'm good to go. I've even got a model that can be used for a Drakon or Dragon rider, but I figured 800 points was enough. There's plenty of dudes around here to play against, especially with Titan Games around the corner who love what Mantic Games are producing. I'm looking forward to getting stuck in. My main problem is that I can't paint miniatures - I have neither the time, talent or the patience to paint the figures up. I'd love to be able to field an army that's wonderfully detailed and presented, but I know that's not going to happen. I'll probably just do what I did with an old army I had when I was wargaming back in 1991, and that's just spray them red and say 'these are mine'. As long as I get to play I'm really not fussed. Now that I've got this force sorted, I'm also working on a Free Dwarf army that will come to about 700 points as I've got loads of miniatures for them, as well. Kings of War is a great game and I've not been this eager to play a wargame for at least twenty years. Once I get used to the game using my Elven and Dwarf armies I'll decide which one I like the best and start buying the Mantic miniatures, as well. Alex over at the blog Cirsova had a look at my last entry about brittle first level magic users and wrote a great entry about wizards as low-level PCs. It's a great read and he has some great ideas in there, so I strongly suggest you check it out, especially if you intend to play a one-spell wonder. On 1st Level Magic Users. STOP THE PRESS - FIRST LEVEL MAGIC USER DIES IN BASIC D&D SHOCKER! It's true. I know you'll find it hard to believe. Last night, Andy's first level magic user was killed after trying to outrun a bear by fleeing into an abandoned tower and falling through rotten floorboards. At full hit points, he was killed by a 1D6 damage roll. Poor Cael! I'd forgotten how lethal D&D could be at lower levels. I myself got knocked down to one hit point by a single hit and only a healing potion was able to bring me back from the brink. We lost our cleric a couple of weeks ago thanks to a critical roll, and now we have no magic user. It's just the dwarf and the fighter left. Saying that I'd forgotten how lethal it can be, it also helped me to remember why it was I got attached to characters who got past the lower levels; they'd survived their first few adventures and with better THAC0, hit points and saving throws they stood more of a chance of survival. It was then that I felt comfortable making plans for the future of the character. Right now, I daren't make plans for dinner. I'm playing a dwarf in the regular Thursday night D&D game and even after two sessions I'm still undecided how to play him. Gruff and miserable? Bombastic and coarse? Violent and unpredictable? My problem is that the only other dwarves I've ever played are Warhammer Fantasy Roleplay dwarves and I pretty much stuck to the archetype - he even looks a bit like the White Dwarf, Games Workshop's prominent character - and now when I try to play one it just comes over as a knockoff of Gimli from the Jackson movies. I've designed a background for him... well, I say I designed it for him, I ported it over from an old ranger character I created for my friend Laura's 3.5 game, but the history appears to suit him. I won't go into details as other group members might be reading this. It's not a game-changing past, just really interesting. The thing is, I honestly can't get his character nailed down. One minute he's gruff and surly, the next he's having deep, meaningful conversations or taking pity on someone. There's no consistency and I'd just like to be able to sit at the table and get into character and know where I'm going with him. I'm a GM, for pity's sake. This playing thing is hard.